"There are so many meanings behind the color blue, but the one that seems to be the most prevalent is that blue is a cool and calming color. This week, take time for focus on the beautiful hues of blue." Since blue is one of my all time favorite colors, I thought this would be a snap. But I was totally wrong. I found nothing blue. At least not when I had my camera (or my phone) in hand. Hues of Blues = Fun! The hues of blues in these beads and fibers are calming, yet fun to me. My favorite go to color. 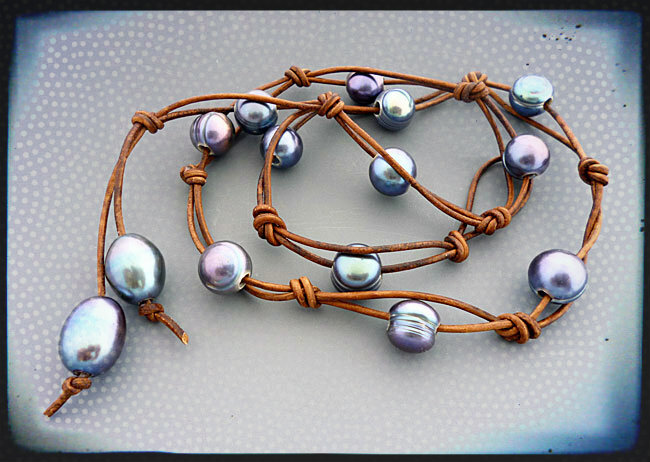 And of course, blue pearls are a signature favorite of mine ! Hues of Blues = My Soul's Love. A feeling of "I am home" comes over me, producing an awe, a calming and a peacefulness that is only satisfied when I am in the midst of the sea,...or ocean. The Pacific Ocean from the Coast of California and the Ligurian Sea, Italy. Hues of Blues = Universal Guidance. When we were a bit lost and I silently asked God/The Universe to show us the way to our hill top rental home in Tuscany, this little blue-eyed beauty showed us 'the road home' to the house (and to the housekeeper - his owner). It was a magical 'sign'. 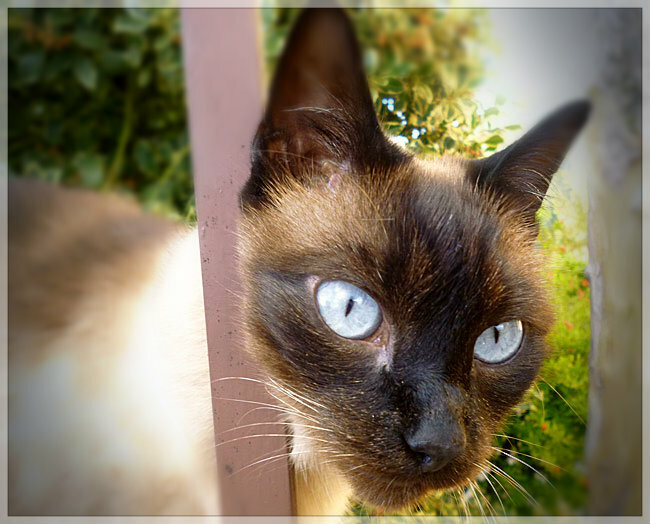 Especially since Siamese are my favorite and my first kitty looked just like this one! "Hues of Blues" that Rock Your Soul!! 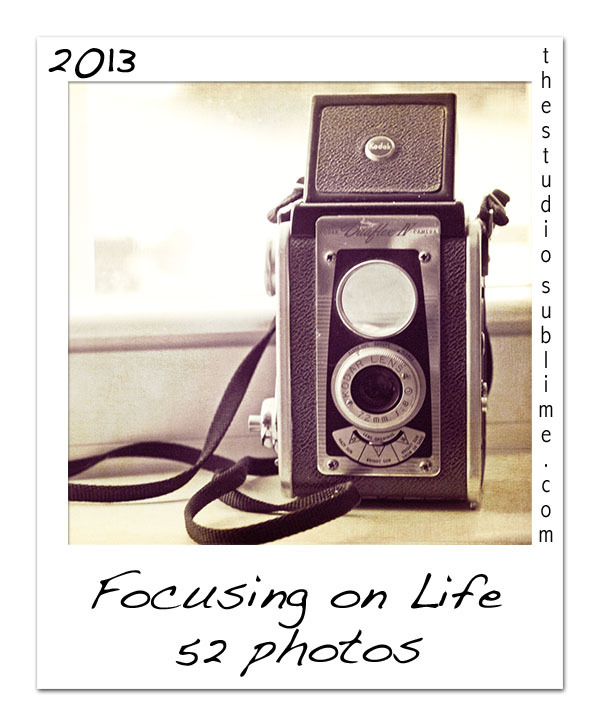 Please hop on over to The Studio Sublime and see what "Hues of Blues" every one else has snapped this weekend. Peace, Love and Hues of Blues, Baby!! Shel, you sure found such beautiful pictures to portray "hues of blue". Glad to hear it's a favorite color just like it is for me. Your pearl necklace is stunning...and I just love the beach shots you put together in a collage. Wow, they just look so breathtaking grouped together! and your kitty is adorable!! Shel you put so much into this post. Great job. I liked your song. The kitty is just gorgeous. The ocean always calms. Your necklace is very pretty - I love pearls as well. I agree so much with your feeling of blue and the sea and ocean. As a child I always said I didn't like blue because when I thought of blue, I thought of either navy blue or that typical blue on sheets of paper while learning the colors in nursery school, and then with identifying and writing them on those same types of grade school sheets we used to have. But Then I moved to a small island in the Caribbean where blue is such a dominant color - although I have a particular color that I call "Caribbean blue," there are so many colors in the sea, and the ocean where I grew up and water in my travels that blue is now my favorite color (still not navy though I must say). I loved living in the Caribbean and my favorite travels have been in tropical locales - such a feeling of calm, warmth and happiness. 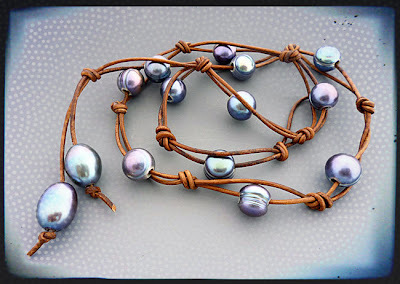 What a lovely blog post - I really love your blue pearls and they look stunning in that necklace. The photo mosaic you did is beautiful and has a wonderful calm, relaxing feel to it - with I was there! Perfect post!!!! I love the kitty....! What a great multi-media post! And I loved how you framed your hues of blue water. Gorgeous! I absolutely love your post today, Shel! I agree with you...I am a "blue girl" too; I get antsy when I am away from the water for too long, my go-to color for beading is always blue (those pearls are magnificent! )...and "the blues" are one of my favourite genres of music. Great stuff! Loved hoe you rounded up your favorite hues of blue! What a lovely post, I enjoyed reading about all the different ways blue comes into your life. Wonderful! Love this post! The kitty story and all the wonderful images. Have a great week Shel. Oh Shel, where to start!!! You did a great job capturing blues. 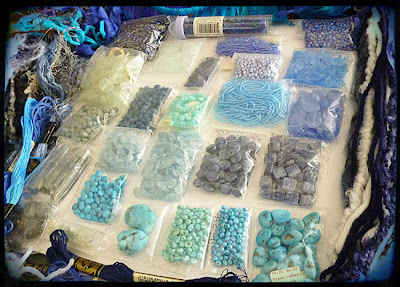 First of all that stash of blue beads and fibers...I'm envious! The blue pearls on leather is beautiful! I'm with you when it comes to the ocean, I feel such a sense of peace when I'm near it! 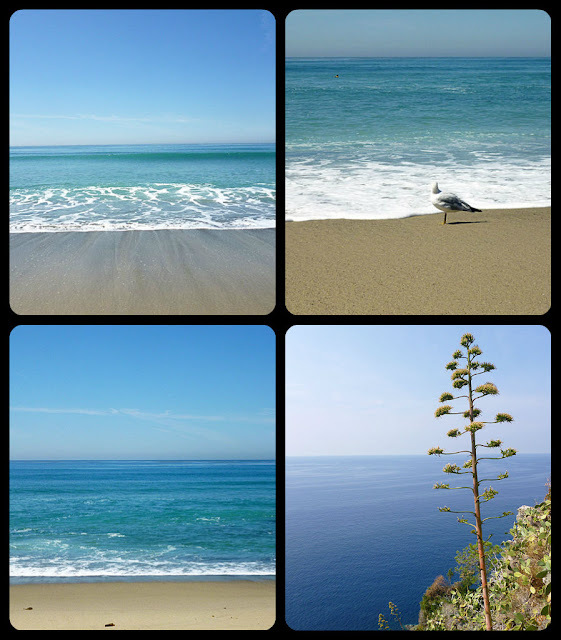 Love your water collage! Pretty kitty... I used to have a blue eyed cat... Weren't you tempted to put it in you carry on and bring it home? I feel the same way about the ocean, you're jewelry is divine!